There are so many cool things to do with your kids in the Santa Ana Watershed, which extends from Big Bear to Newport Beach, coving much of the Inland Empire and Orange County. One thing that these two regions share is a water supply – if you live in the IE or the OC, most of your water comes from local snowmelt. Hunter and Emily play in the snow for the first time! The Santa Ana Watershed encompasses all of the best of SoCal living – the mountains, the desert, and the beach – and sightseeing locally is a great way to have fun with your kids without burning a ton of cash. 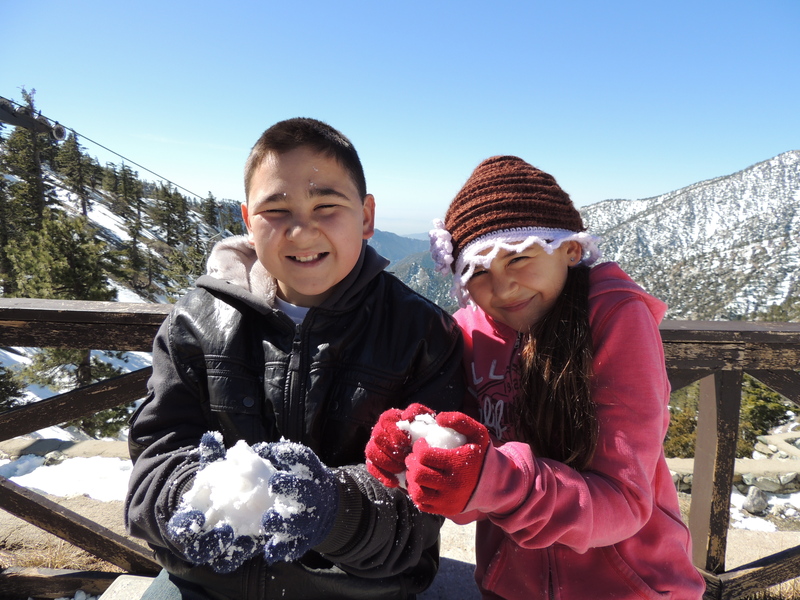 I took my niece Emily (10) and nephew Hunter (11) t0 “kid-test” the best, and cheapest, places in Mount Baldy for fun snow day on a family budget. 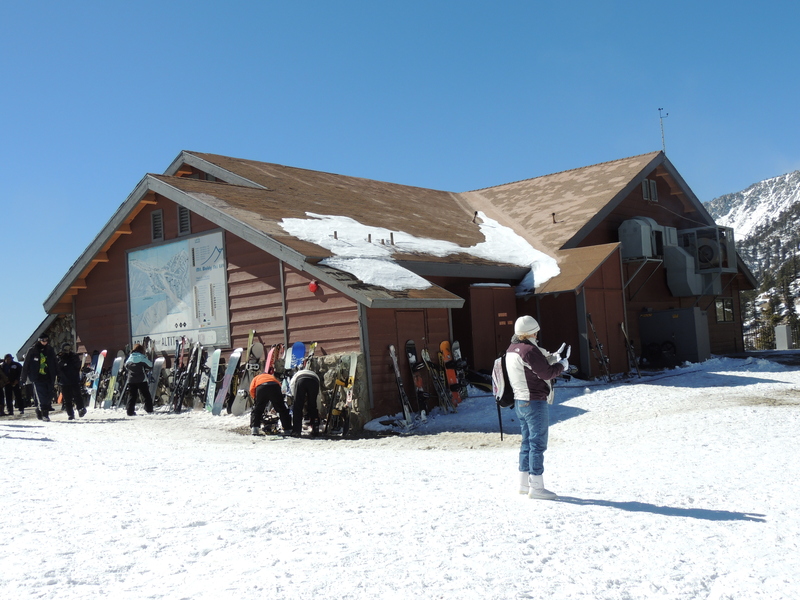 The flats near Snow Crest Lodge are a popular – and wallet friendly – destination. One of the best parts about living in SoCal is that we can enjoy mostly sunny warm weather and the drive to our snowy mountains for a day of fun, without the work of shoveling out our cars in our own driveways. 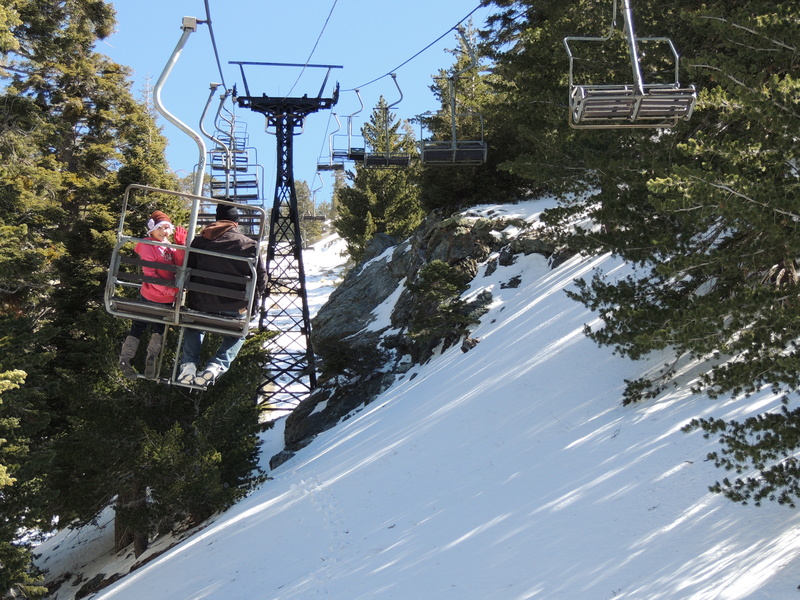 If Big Bear is too much of a drive for a short day-trip, you might want to try Mount Baldy for an easier day in the snow. It is a short drive from the 210 Freeway (Mountain Avenue Exit). Be sure to check the snow report here to make sure that there’s enough white stuff on the ground when you arrive. On the weekend after a cold storm, you have several options. The cheapest of them is to stop near Snow Crest Lodge. It’s 4 miles past Baldy Village and the village’s Ranger Station. Right across from Snow Crest Lodge is a large camping area that is full of families playing in the snow during the winter. I have only seen snow at 2-3” deep there, but it’s enough for sledding, snow-fights, and making snowmen. Directions: Mt. Baldy has one road in and out, so it’s difficult to get lost. The main fork to be watch for leads off to Ice House Canyon – you don’t want to go that way, you want to go toward the ski lifts and stop at Snow Crest Lodge. Warning: you will have to find parking along the road, which can be difficult as that play area is extremely popular. If the snow is extremely deep, the Ice House Canyon fork is the place they stop you to check for chains on your tires. Emily waives as we ride up Mt. Baldy Ski Lifts. Getting to deep snow requires more of a monetary investment, but it was the highlight of the day for Emily and Hunter, who had never seen more than a dusting of snow in person. For that, drive to Mt. Baldy Ski Lifts, which is as far as you can drive up the mountain. Parking in the winter is $5, but the lot contains lots of space. From there, take the ski lifts (or “Scenic Ride”) to the skiing area. The ride was Hunter’s second-favorite part of the day. The ski-lifts are the old-fashioned kind, a two-person chair attached to the lift (be sure to pull the safety bar down – they don’t do it for you!). But the result is a nice slow glide up the mountain, skimming past trees and snowy cliffs. It takes 15-20 minutes on average. One benefit of the ride is that it gave me a chance to sit and talk with Hunter – there was no TV or cell phone to distract him. Hunter makes a snow angel. Once we got to the top, the snow was a nice, thick blanket. The top of the lift has a cafeteria (The Notch), a ski school, a tubing park, and more lifts. There is a snowy bank right next to a second ski lift that was perfect for playing. This was the best part of the day. From Emily: “I loved it when we stepped in the snow and it went all the way up to my knees!” It was like someone flipped a switch – the two of them ran into the snow, flopped down, and started making snow angels. Then, forget about actually making snowballs for a fight, they just started flinging snow at each other (and their two uncles who accompanied us). Fair warning: moms wanting to avoid sibling fights might want to set sports-style rules about where one can aim a snow missile. Eyes and other sensitive areas should be avoided. All of us worked to learn how to make a snowman, which was “accidentally” destroyed before we could get a picture of it. 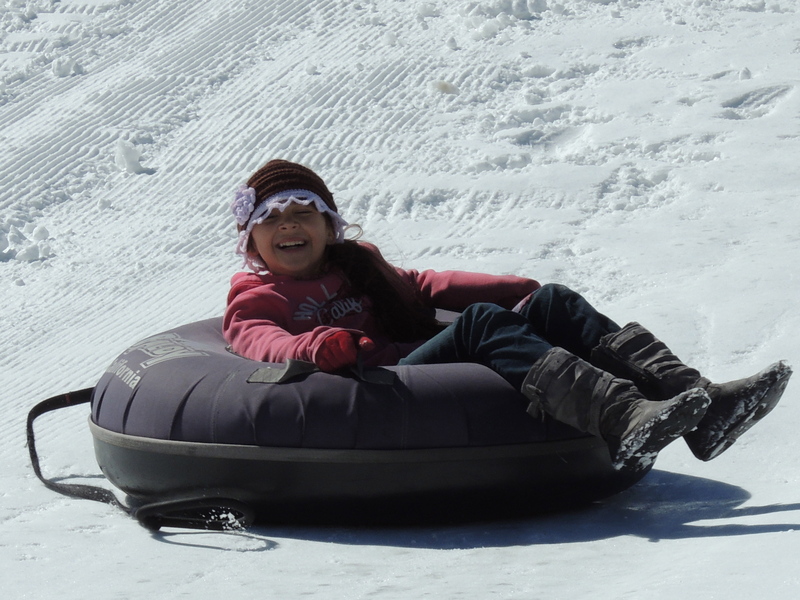 Emily flies down the hill at the Tubing Park. 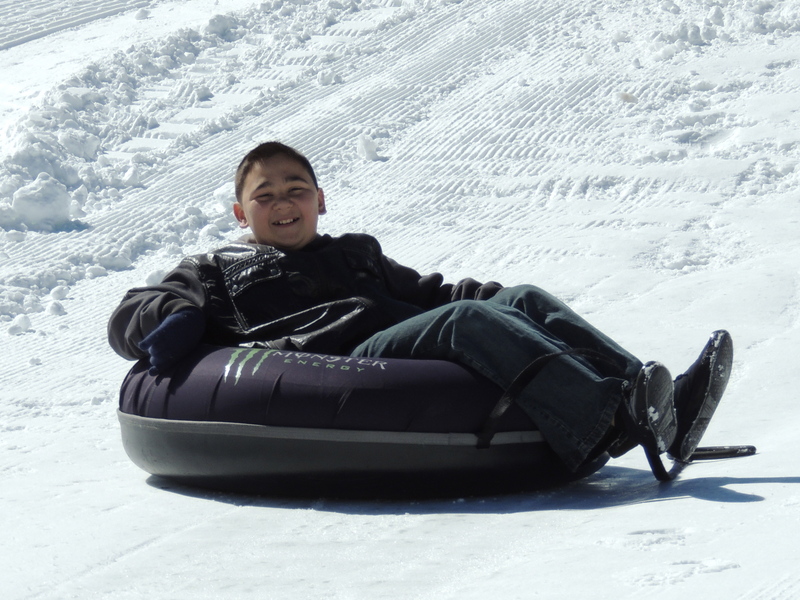 The tubing park is an option once you get up to the ski area. 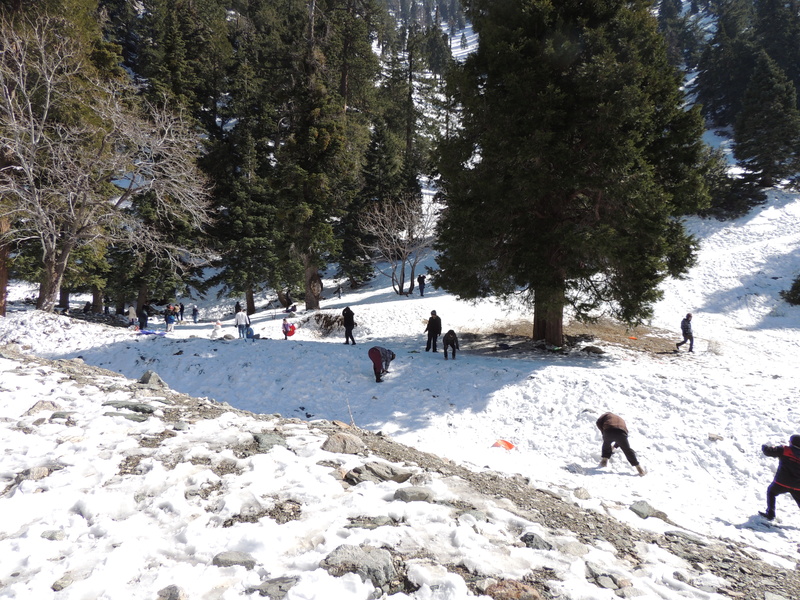 The kids thought it was fun, the deep snow was still their favorite part. The tubing park kind of resembles a skating park in that there you slide down and incline and immediately up another (that stops you, and you get up and drag the tube back up the hill). An attendant will load your little one into an inner tube and, using a large tether, swing or spin them over the edge. There are lanes separating each rider, so there is no chance of them running into another rider in another lane. Adults are allowed to go too, and adults must ride with kids under 42” tall. Hunter thought climbing back up the hill was just hard enough to be good exercise. I have to say, he’s right. It wasn’t difficult, but it was a pretty good workout. The Notch is the only place to get food at the top of the lifts. If you want to eat at the top of the ski-lift, there is only one option – The Notch. Hamburgers, hot dogs, nachos, chili, burritos, and pizza are your basic choices. Emily enjoyed her burrito, and their Uncle Mike, who is my brother-in-law, liked his cheese pizza. However, the food was a tad pricey, perhaps a reflection of the difficulty of running food service in such a remote area. If you want to save money or eat healthier food, your best bet is a “car picnic” once you get down the ski-lifts. You can make sandwiches at home and put hot soup in thermoses. Put coffee and hot chocolate in spill-proof insulated mugs, and you can warm up easily. Shed layers and put them in your trunk before you climbing into your car. Once you get the kiddies in, put beach towels over their laps and let them dig in. Also, save your car by lining the seats and the floor with beach towels for wet feet and wet pants. For girls: put a tank top or cami under a long-sleeved t-shirt, think about putting tights on under jeans. If you have a raincoat, you are golden, layer it over a sweatshirt. If not, Emily did well with two hoodies. If your girl has water-proof boots, choose that option. Emily’s boots were not water proof, and her feet got soaked. If I had really thought it through, I might have cut the corners off of a garbage bag and taped that over her socks but under the shoes to keep her feet dry. Hats and gloves, even knit ones, are a big bonus. For boys: put a long sleeved shirt under a short-sleeved shirt. If he has a raincoat, layer it over a sweatshirt. If not, use more sweatshirts. Jeans should be fine as well. I’m sure I don’t have to point out that the chances of getting a boy into tights is zero, and the extra warmth would not be anywhere worth the complaining (or the teasing from my husband). Also, if guys have hiking or construction-type boots, those are your best bet. Hunter just had tennis shoes, and while his feet looked wet, he did not complain. Hats and gloves are a big bonus too, even if the hat is just a ball cap. For women: I wore casual knee-high boots that I’m not overly attached to and probably came out the best of the bunch. I wore jeans with thick socks, a sweater and cami, and a raincoat. I had knit gloves and a knit hat. For men: undershirt, long sleeved shirt, sweater or sweatshirt, then jacket (waterproof if possible). Jeans are fine, and try to find some waterproof shoes. Emily wanted to bring some snow home, but it all reaches our homes eventually because some of our water comes from local snowmelt. Hunter was fascinated to learn that all this snow is where more than half of the water he drinks and uses comes from. Snow basically acts like a reservoir, holding water for us until it melts. 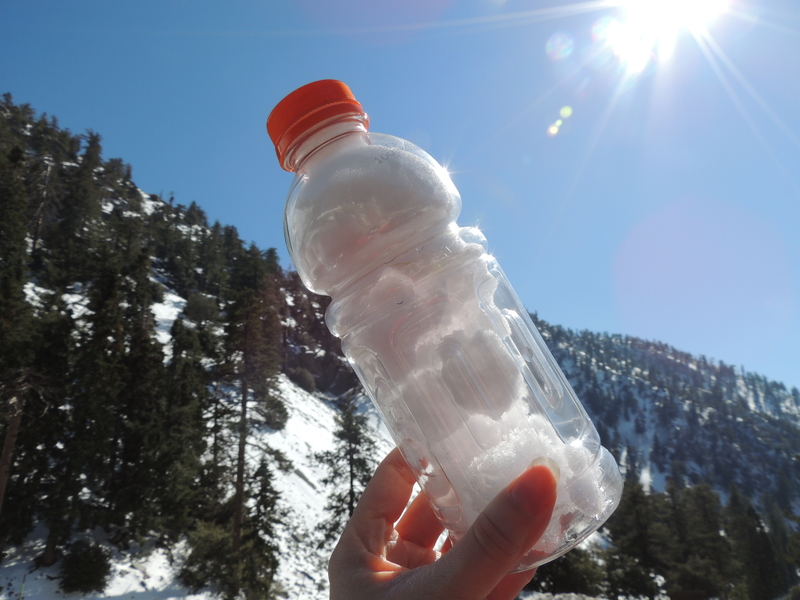 When it does melt, it runs down the mountain in streams and turns into rivers – the biggest being the Santa Ana River. In the IE and the OC, we “bank” a lot of our water in natural underground aquifers and keep it for dry summers and dry years. When we pump it out, we filter and clean it before sending it to your house, but what you get is basically the snow and rain of years past, made fresh again. Hunter kept pointing out melting snow, and on the way down the mountain, I showed him the very start of headwaters – a giant sinuous ditch that still remains frozen at this time of year. There are so many cool things to do with your kids in the Santa Ana Watershed, which extends from Big Bear to Huntington Beach, coving much of the Inland Empire and Orange County. One thing that these two regions share is a water supply – and if you live in the IE or the OC, most of your water comes from within this area. Emily, Hunter, and I at Huntington Beach, where the Santa Ana River meets the Pacific Ocean. 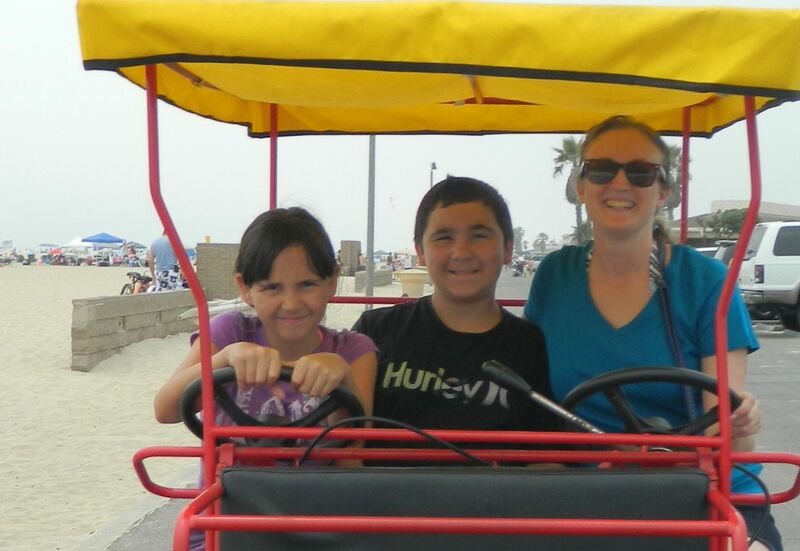 The Santa Ana Watershed encompasses all of the best of SoCal living – the mountains, the desert, and the beach – and sightseeing locally is a great way to have fun with your kids without burning a ton of cash. We will visit many places in the IE and the OC together and all of it is “kid-approved” by them. Want to explore more places in the watershed? Take a look at SAWPA’s map of things to do in the Santa Ana Watershed, which extends from Big Bear to the beach!